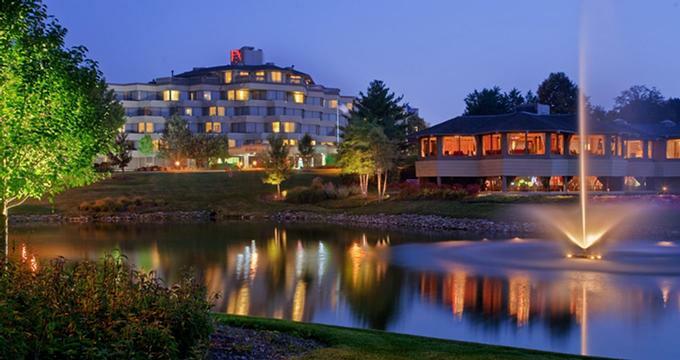 The Hilton Chicago/ Indian Lakes Resort in Illinois is a great weekend getaway from Chicago for family travelers and couples alike. 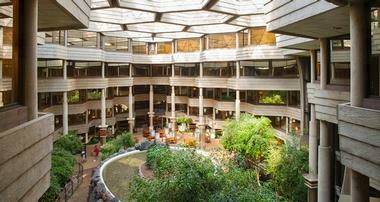 With a majestic six-story atrium and an indoor waterfall, the lobby presents a dramatic welcoming entrance. The Hilton Chicago/ Indian Lakes Resort is also an official Biggest Loser Resort that incorporates the five pillars for weight loss success: fitness, nutrition, education, relaxation, and camaraderie. The program echoes the popular television show of the same name. Working alongside professional, certified counselors and fitness coaches, guests can work towards achieving their fitness goals, relax in the spa, swim laps in the pool, or take advantage of the 24-hour fitness center. 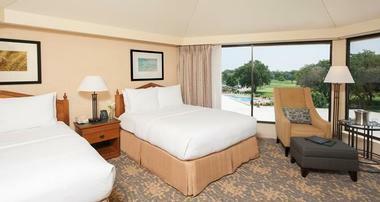 Guest rooms offer Wi-Fi access and a 37-inch television with DIRECTV featuring over 55 cable channels. The rooms come with either king, queen, or two queen beds, and handicap accessible rooms are available. There are fifteen rooms with PURE Allergy Friendly linens, creating a welcoming space for any guest. In-room amenities include a data port, an iron and ironing board, hair dryer, and an in-room coffee maker. The twelve Hospitality Suites, perfect for smaller meetings, and a more private common area, feature connecting bedrooms depending on guest needs. With a selection between the many business suites, guests can enjoy the parlor areas for meetings, corporate meet-and-greets, or simply for relaxation. Free Wi-Fi is available in these areas. In addition, the hotel features six Penthouse suites with king sized beds and whirlpools in the spacious bathrooms. The parlors contain large pedestal dining tables, a wet bar, and a wood-burning fireplace with an outdoor deck. There are a variety of dining options within the resort. Guests can enjoy a select menu of American cuisine whether they are dining in-room, having a cocktail in one of the many lounges, or enjoying a night out at the choice of restaurants – there is something for every palette. Guests can order from the in-room menu seven days a week between the hours of 6 am to 11 pm. The Cave Bar, framed by the stunning indoor atrium, is a great place to go for a relaxed bar-like atmosphere to enjoy starters and cocktails. They offer specialty drinks, a large beer selection, and tasty appetizers. Guests can wet their appetites here before stepping into one of the full-service restaurants on site. Izzy & Moe's is located on the lower level, containing a fun speakeasy ambiance that calls to mind another time. Visitors can enjoy live music, DJ's, karaoke, sports coverage, video games, and dancing in this fun social atmosphere. Appetizers and cocktails can be enjoyed here as well on most days. For the golf aficionado, the Masters Clubhouse, boasting a nice view of the course, provides a relaxing lounge for those coming in from a day on the range. In this restful and welcoming atmosphere, guests can peruse the menu of appetizers, grilled options, flatbread sandwiches, wings, appetizers, and salads to refresh their palate after a day of activity. 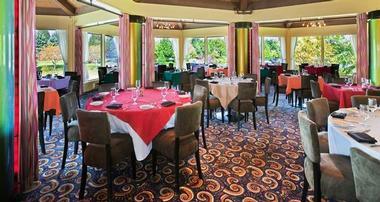 For a more formal evening out, Shiraz on the Water provides a fine dining ambiance. Located on the edge of the scenic waterfront, guests can sip a glass from the award-winning wine list while choosing from the American cuisine available on the menu. The restaurant is open from 5 pm to 10 pm, seven days a week with a Champagne brunch on Sunday. Guests can unwind at the Resolution Spa & Wellness Center. As part of the offering with the Biggest Loser Resort status, the trained staff can assist guests as they utilize the spa's many services. From facials, manicures, and other beauty treatments to wellness offerings like hot stone treatments, cellulite solutions, and a variety of day spa packages, guests have many options to find a bit of serenity. Muscular massage, restorative treatments, and circulation and energy focus are also available. A couples massage is a great way to start the evening and get rejuvenated after an active day or before a dinner out. Skin and body analysis ensures that each guest receives the treatment perfect for them. Massage packages can also be added on to catered group events or enjoyed by individual guests. Spa hours are Monday through Saturday, and Sunday from 10 am to 4 pm, with 24-hour access to the fitness room. Guests can enjoy a relaxing day on the greens at the Blackhawk Trace Golf Course. 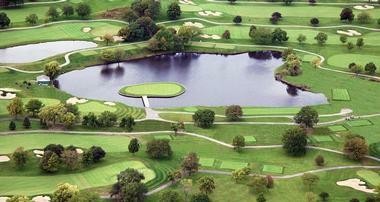 This unique course features three nine-hole courses, which guests can double up for a full 18-hole game. There is a driving range, sand bunkers, and putting greens for those looking to hone their skills, as well as professional PGA staff on hand. Junior programs are also offered to those seeking lessons. 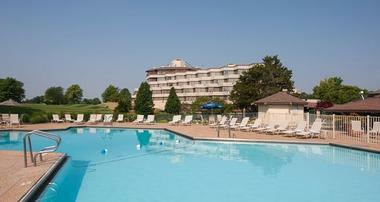 Accommodations are available for up to 240 players. The pro shop provides extra tees, extra balls, accessories, equipment, apparel, and footwear. Clubs are available for rent to the casual golfer as well. In addition to the golf course, guests can also enjoy themselves at the Masters Clubhouse Restaurant, which is connected to the driving range. The hotel also has a pool, tennis courts, a video arcade with pool tables, nearby hiking trails, and a fitness room, so there is something available for all levels of activity. This resort makes families feel welcome by providing a plethora of conveniences for those traveling with children. Including breakfast and complimentary Wi-Fi, the Family Fun Package allows families to relax without stressing over the details. They can simply get started and enjoy the day. This is a perfect getaway with many family friendly activities in the surrounding area. In-room cribs are available on request, and the restaurants feature a varied children's menu, making this the perfect family getaway. The resort contains 28 multi-function rooms that allow for a large number of guests ranging from 12 to 1,200 depending on the needs of the party. The hotel offers both indoor and outdoor spaces, along with complimentary Wi-Fi in all meeting spaces. The Sales and Catering Team is available to accommodate the planning process, offering specialized packages that can include the cake, open bar, champagne, and unlimited wine with dinner. Choices range from white linens, honeymoon packages including suites, next day breakfast for the wedding couple, and a return one night visit on the first year anniversary. 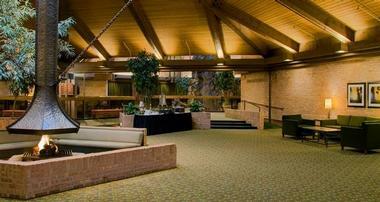 The hotel features a six-story atrium with a fireplace and indoor waterfall, adding an air of glamour to any event. With an outdoor option providing a total of over 14,000 square feet of scenic space and 50,000 square feet of indoor event space, this is the perfect venue for weddings, meetings, or other special functions. 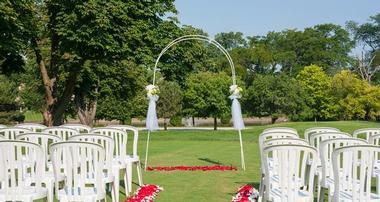 Available menus include the Quinceanera package, the South Asian Wedding Package, and the Traditional Wedding Package. The spaces available are also ideal for conferences and corporate business functions. The hotel provides a number of amenities that make this an ideal locale. Every public area and guest room contains wireless HSIA, and rentals are available for Audio/ Visual equipment as needed. The hotel provides printers with complimentary printing services, and they have a business center, fax machine, office rental, and photocopying services. Complimentary self-parking is available as well as valet service for $5. Pets are allowed with a $50 non-refundable deposit and a maximum weight of 75 pounds. Guests can expect amenities such as room service, accessible rooms, baggage storage, electric service, elevators, and an on-site ATM. Other features include elevators, on-site gift shop, laundry and valet service, area transportation, a multi-lingual staff to assist travelers, room service, and available safety deposit boxes. More specialized features available upon request include assistive listening devices, closed captioning for televisions, guest accessible text telephones for the hearing impaired, and van parking in the self-parking area. Families, couples, and business travelers can enjoy a variety of escapes. The hotel is 30 minutes from Chicato, meaning guests only need to take a quick drive to find a variety of attractions. Kids can revel in the fun at LEGOLAND Discovery Center only nine miles from the hotel or the Dupage Children's Museum. Couples can stroll the aisles and attend a wine tasting at Lynfred Winery or take in a movie at the Hollywood Blvd. Cinemas. Guests can attend the Brookfield Zoo or bowl a few frames at the Brunswick Zone. Other nearby attractions include the Arlington Park and Racetrack, Chicago Indoor Racing, Laser tag, Medieval Times, Stratford Square Mall, or the Morton Arboretum. There is something available for everyone to enjoy in the Chicago area. 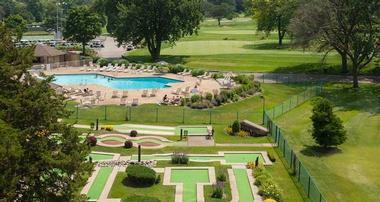 You may also like: Best Weekend Getaways from Chicago, Illinois.